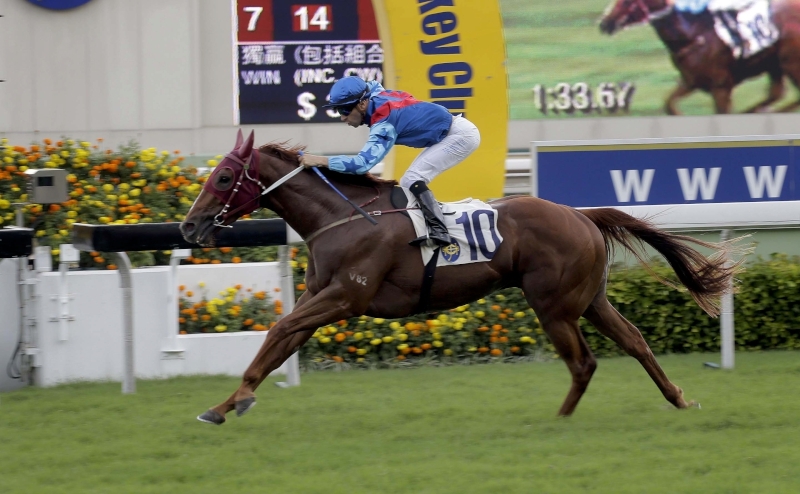 Rapper Dragon heads towards the BMW Hong Kong Derby with a lofty rating and a reputation to protect, and trainer John Moore remains confident that his star four-year-old will live up to expectations in the HK$18 million BMW Hong Kong Derby (2000m) a week Sunday (19 March). That conviction was not troubled this morning, Tuesday, 7 March, when the talented Street Boss gelding was among a clutch of Derby entrants engaged in barrier trial action. 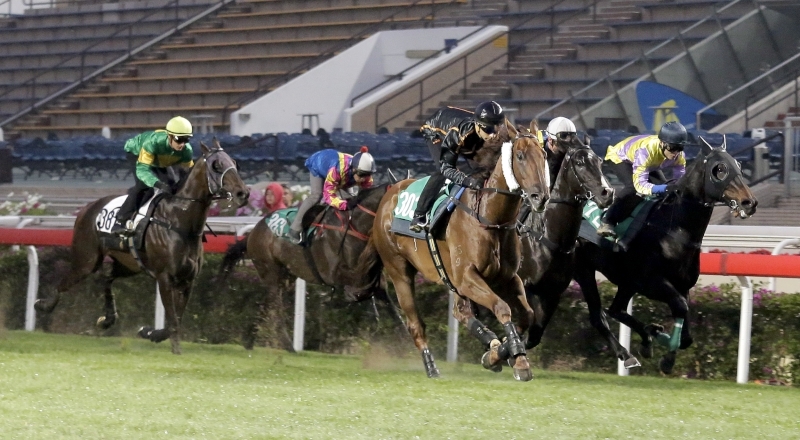 Never one to set the turf alight during such assignments, the chestnut travelled well enough under Joao Moreira to finish an easy two and a quarter lengths seventh of 10 in batch one; his time for the 1000m stretch out was 59.13s. 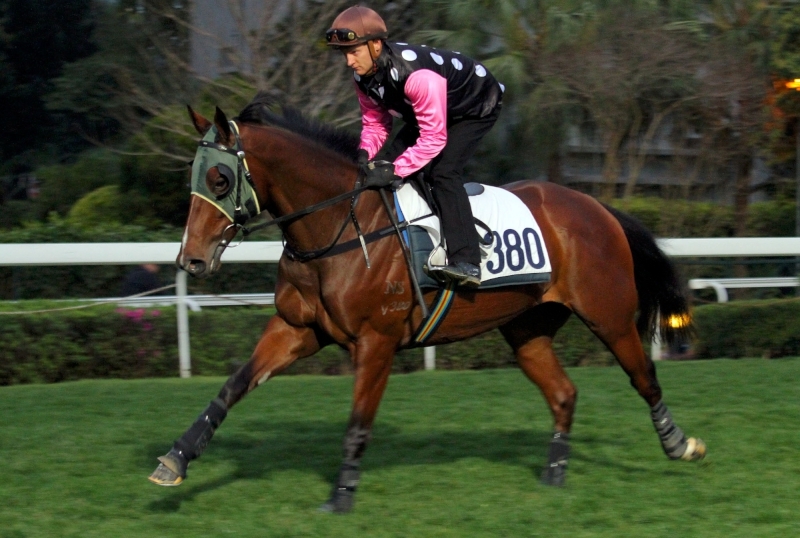 Rapper Dragon (with hood) pleased trainer John Moore in finishing seventh in a 1000m turf barrier trial today. 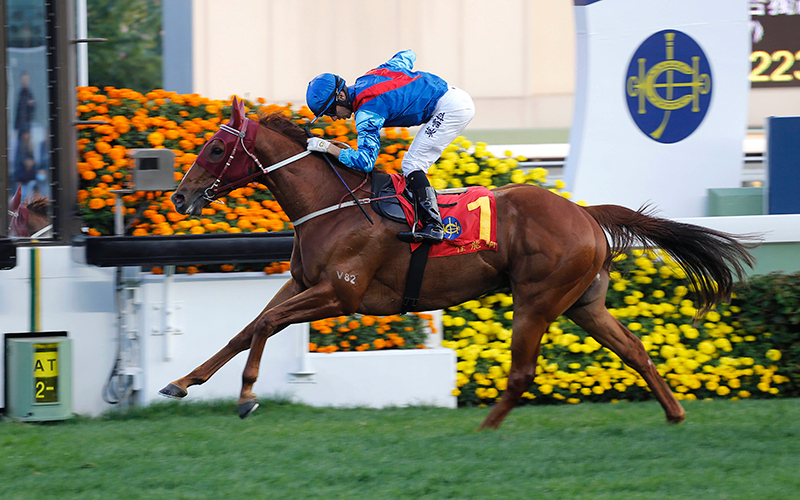 “Rapper Dragon has never been a flashy trialler and again he just did what he had to do. That was what we wanted and what we expected. There’s still more to come, he’ll work at the weekend and he’ll have a gallop on the turf next Thursday,” Moore said of the 114-rated performer. 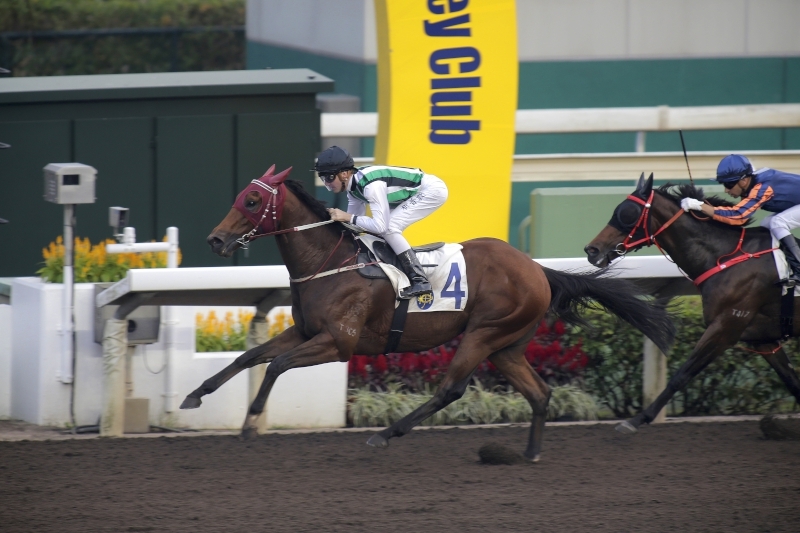 Rapper Dragon will attempt to make history as the first horse to win all three races in Hong Kong’s Four-Year-Old Classic Series. 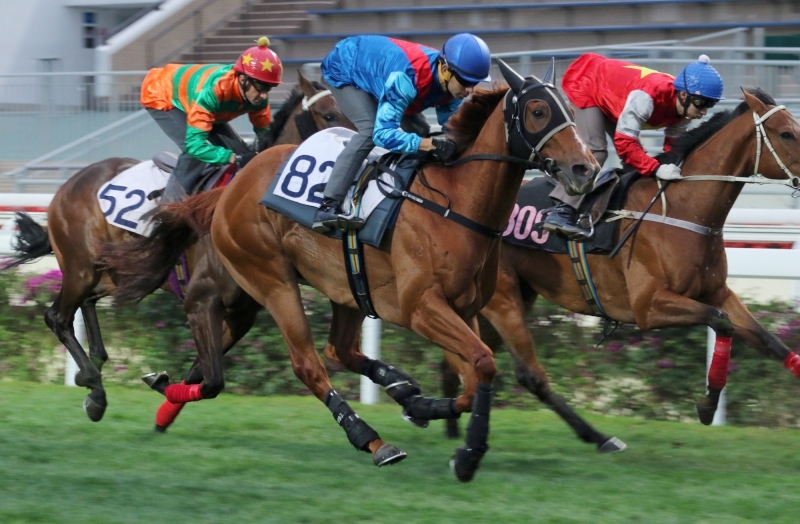 Stablemate and rival Beauty Generation, third and then nowhere behind Rapper Dragon in the series’ first two legs, the Hong Kong Classic Mile (1600m) and Hong Kong Classic Cup (1800m), this morning gave connections hope that he can be a contender in the upcoming blue riband. The Road To Rock gelding traversed the turf with verve as he finished a half-length fourth in the same batch, in a time of 58.87s. Beauty Generation finishes fourth in the same batch as Rapper Dragon this morning. 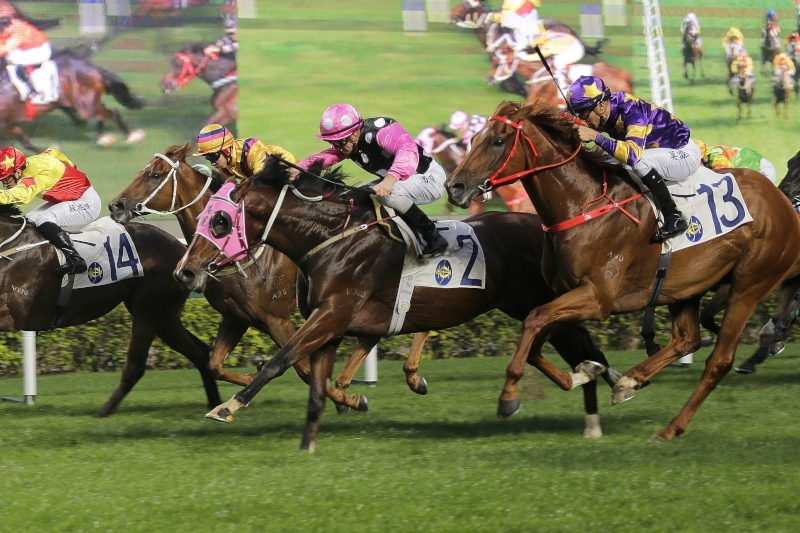 Moore anticipates further improvement as he tunes the bay for the upcoming 2000m test and indicated that, this time, his charge will not press forward and race as close to the pace as he did in the Classic Cup. With the Classic Mile and Classic Cup already in the bag, Rapper Dragon has shown that he has the measure of most of his likely Derby opponents. 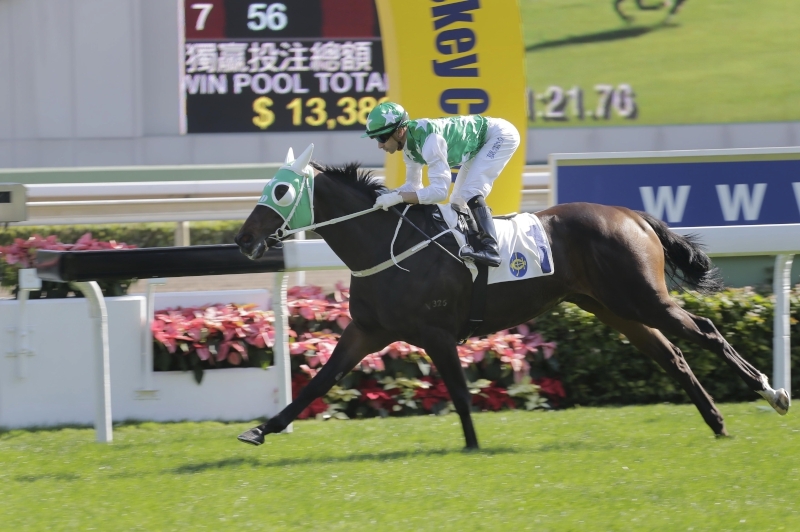 A step up to 2000m is something of an unknown factor, as is his stablemate Booming Delight who enters the Four-Year-Old Classic Series for the finale. The British import has made his way to a Derby berth with a hat-trick of wins that includes a Class 2 score at the course and distance last month. 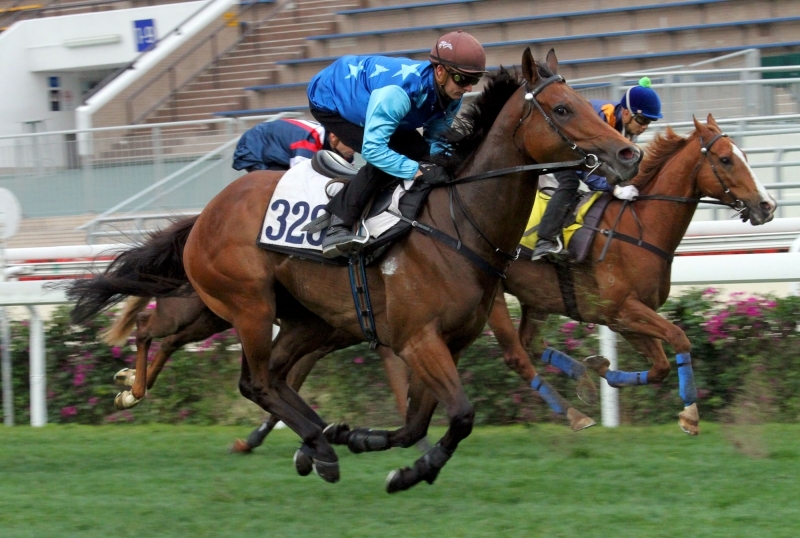 The bay, sixth in the Britannia at Royal Ascot last year and a full-brother to G1 Racing Post Trophy winner Rivet, impressed this morning in batch 10, a 1200m trial over Sha Tin’s all-weather track. 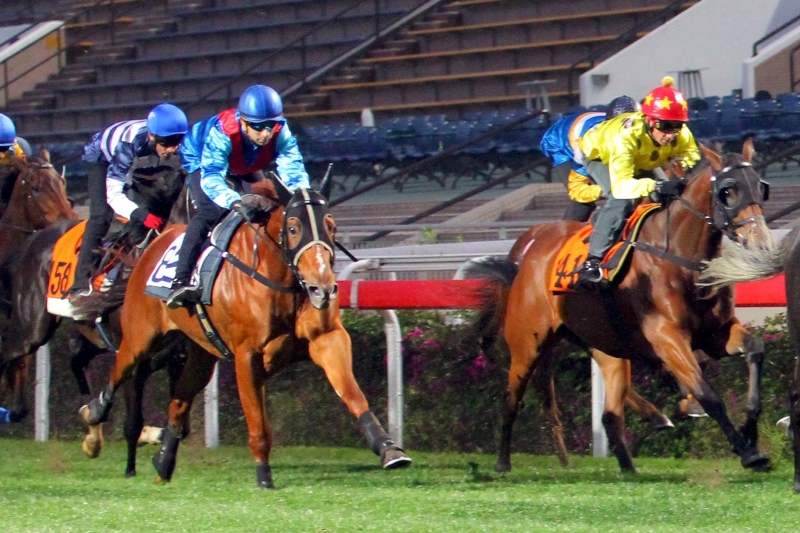 Booming Delight (in yellow) is fifth past the post in a 1200m barrier trial on dirt today. 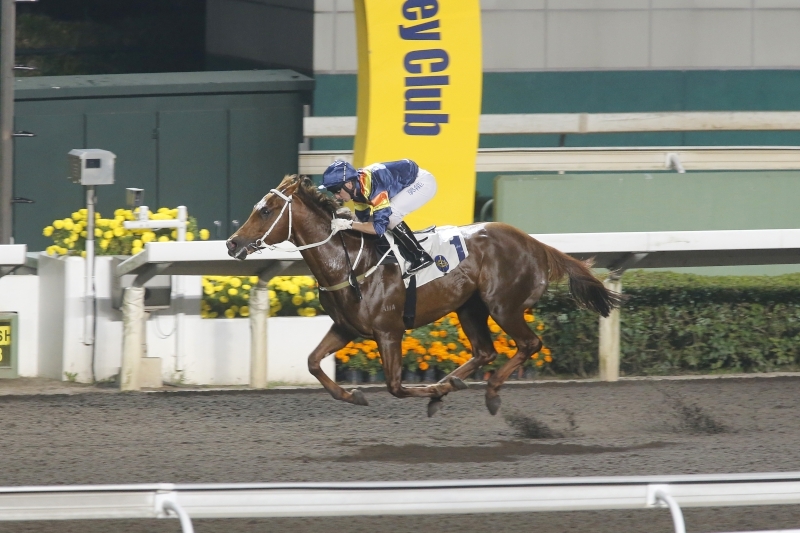 Once jockey Karis Teetan switched Booming Delight to the outside, his mount ran home smartly to clock 1m 11.20s in finishing fifth. 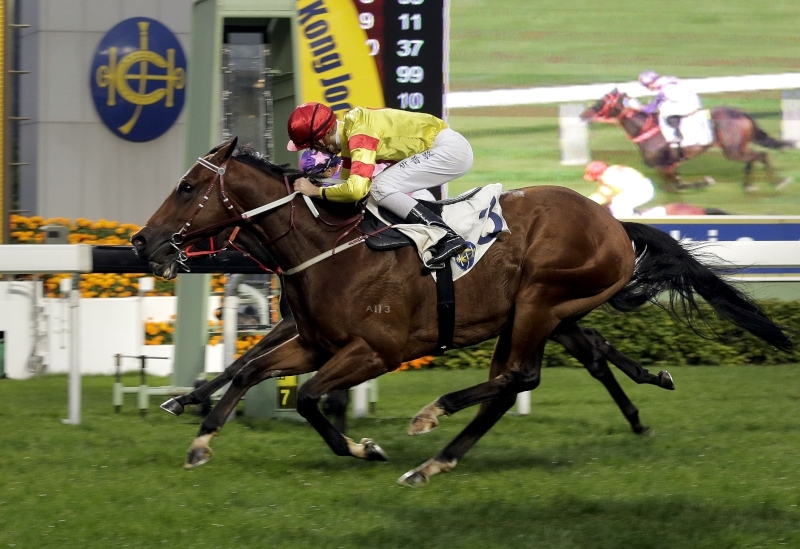 Moore and owner Peter Law will fly in Ryan Moore to partner the exciting Fastnet Rock gelding in the race, which the jockey came closest to winning when second on the Richard Gibson-trained Got Fly in 2015. “Ryan Moore will come in to ride the horse,” Moore confirmed. “He’s the dark horse for the Derby. I’m not sure where he stands in comparison to the others. How good is he? I’m not sure. There’s a lot of upside there from a rating of 94, so he could turn out to be a real find, but he still has to prove it in this company. Moore has a strong Derby hand. Two of his charges with Group 1 wins already on the board also stepped out in this morning’s trials. 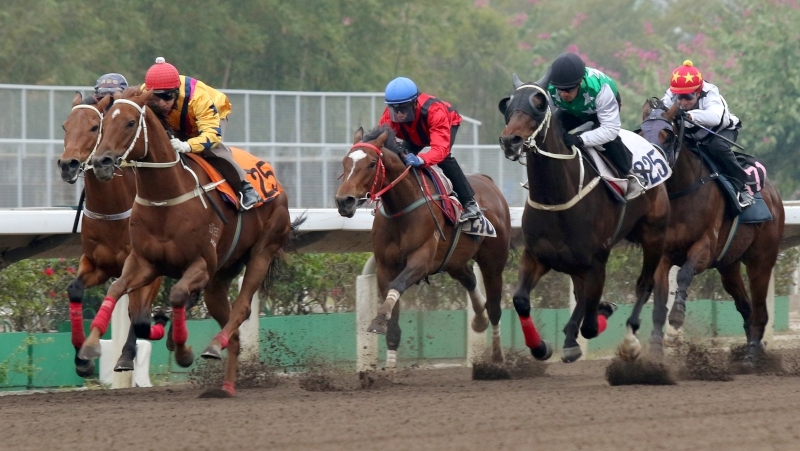 Helene Charisma (4th) and Eagle Way (8th) both went in batch nine, a 1600m turf trial, which also attracted fellow Derby contenders, the Danny Shum-trained Seasons Bloom (6th), placed in the Classic Mile and Classic Cup, and the John Size-trained pair of My Darling (2nd) and Dinozzo (10th). 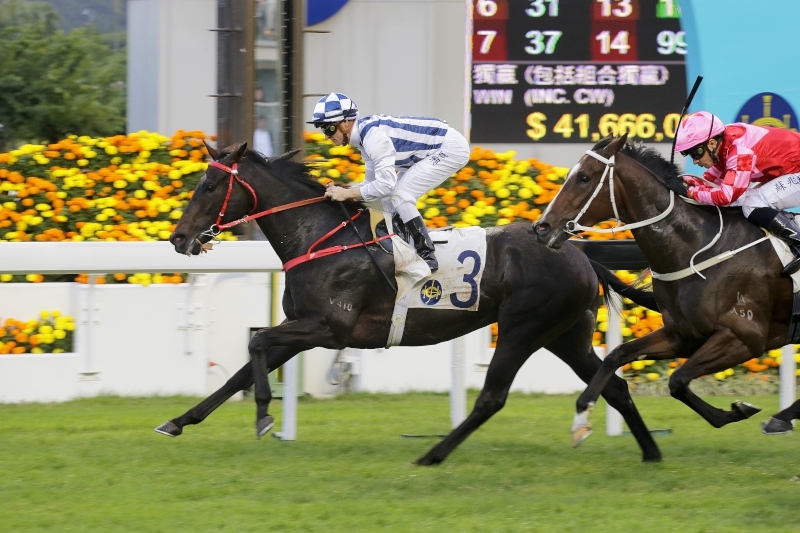 Helen Charisma, last year’s G1 Grand Prix de Paris (2400m) winner, moved well, while G1 Queensland Derby (2400m) victor Eagle Way did all that was required. “That was a good trial by Helene Charisma. Douglas (Whyte) was very happy and the horse enjoyed it,” Moore said. Meanwhile, one rising star four-year-old without a Derby agenda was also in action. 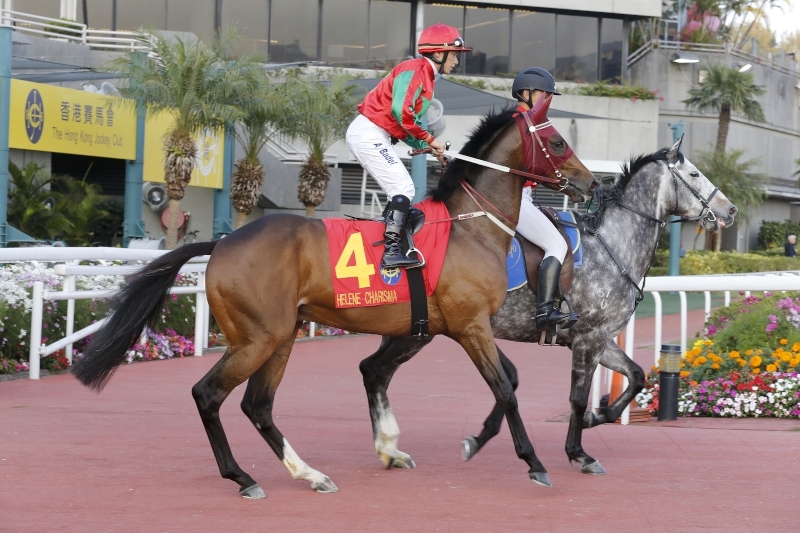 Jing Jing Win has not raced since losing his unbeaten tag on 11 December. 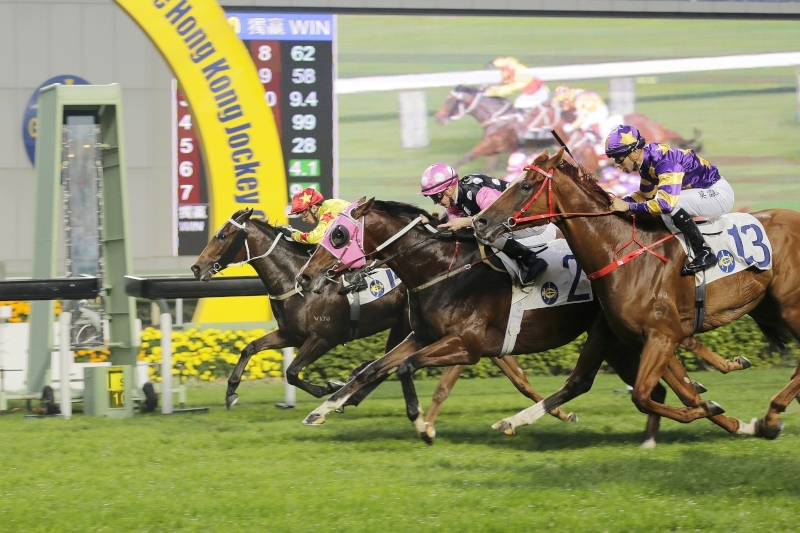 The David Hall-trained gelding, the HK$8.5 million top lot at last year’s Hong Kong International Sale, is being aimed at the Derby undercard. 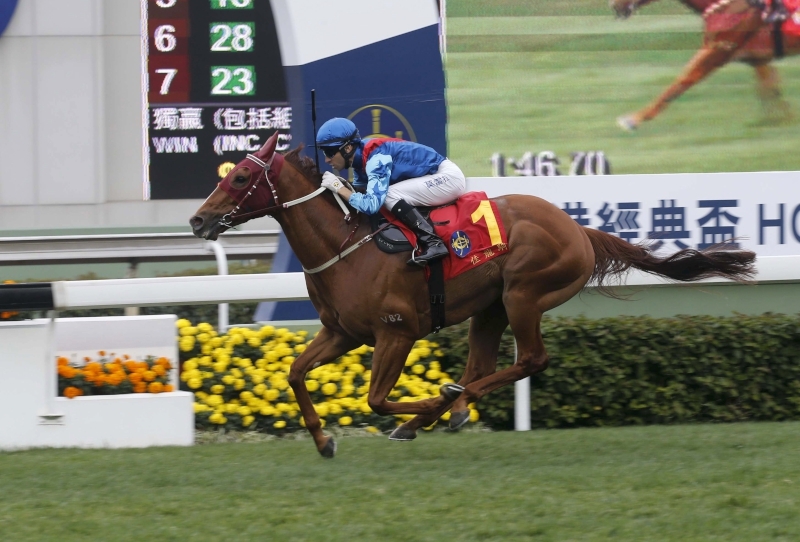 The two-time winner travelled easily in batch three, cruising down the 1000m straight without pressure to pass the post fifth in a time of 59.92s. But all was not as straightforward as it might have seemed. The son of Starcraft once again displayed an unwelcome propensity to sit down in the starting gate. 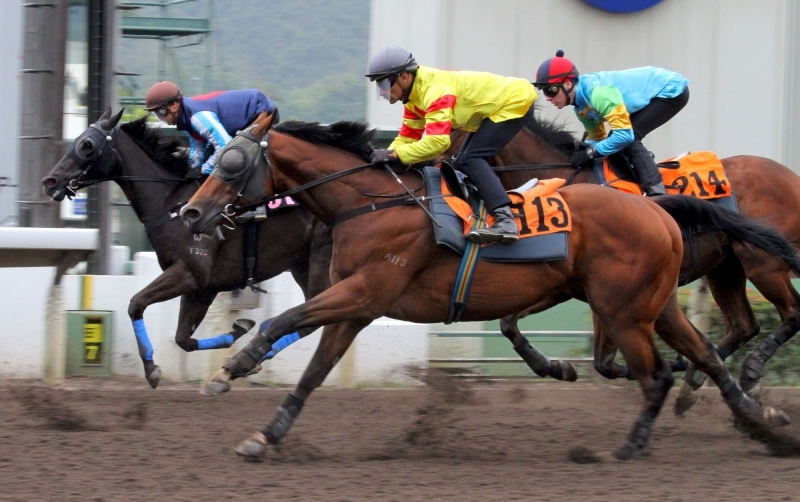 Jing Jing Win (brown cap) has an easy trial this morning at Sha Tin. “Once we got him out of the gates it was a case of letting him cruise through his trial, he doesn’t need to be put under any pressure. 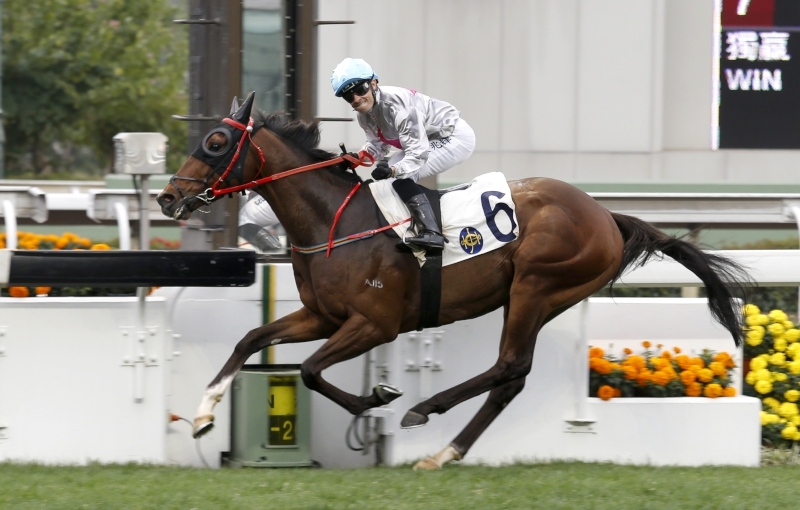 He’ll run on Derby day,” Purton said after riding him. 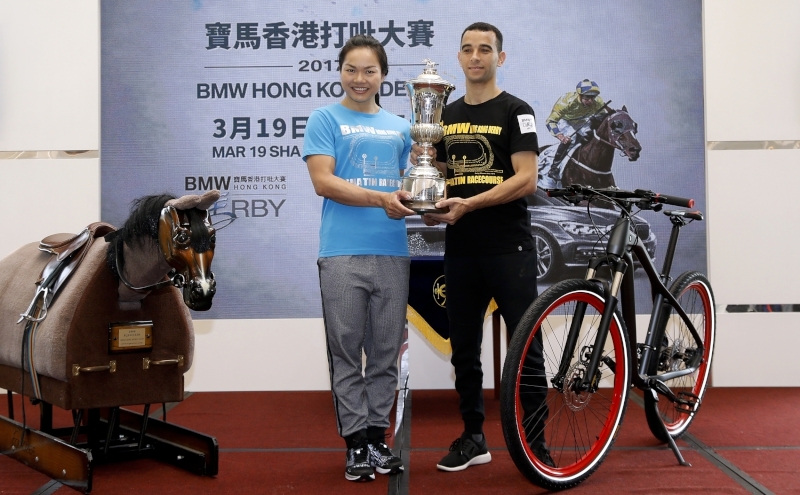 The Hong Kong Jockey Club will present a live webcast this week showing the 2017 BMW Hong Kong Derby Selections Announcement. The live cast will be available here at approximately 11:55am on Wednesday, 8 March.